This was my first year attending the Game Developer’s Conference as press, and I spent a lot of time crawling the expo hall and sessions, looking to uncover cool new games and behind-the-scenes development stories. 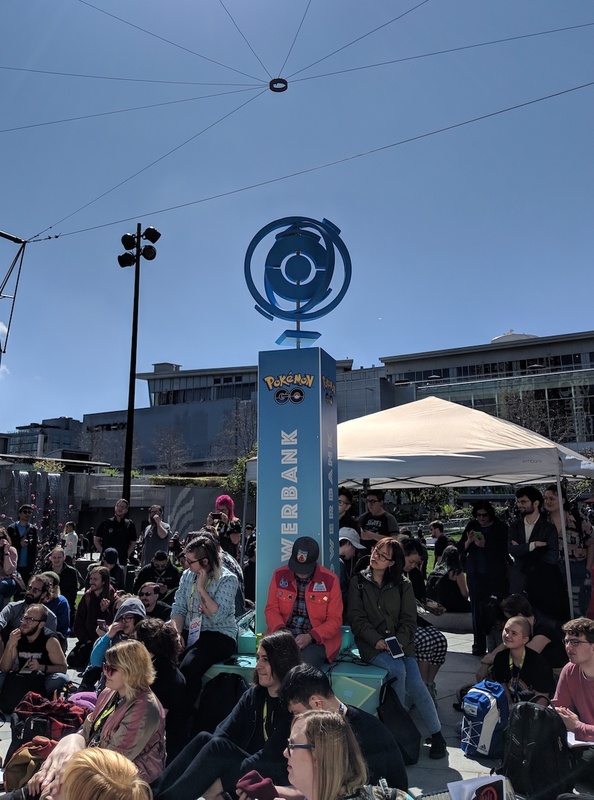 But on Thursday afternoon, I took a break from the crowds at Moscone Center in San Francisco to sit down in the nearby Yerba Buena Gardens public park for something completely different: the seventh annual Lost Levels. 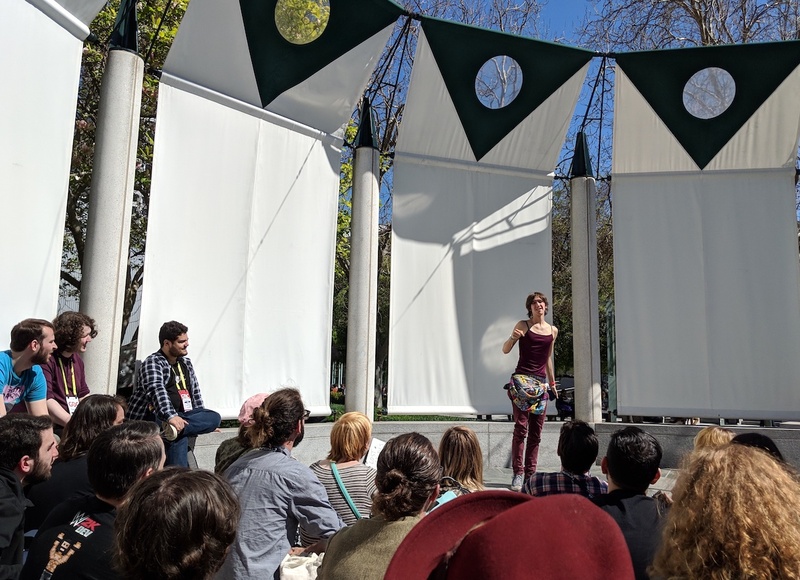 Lost Levels is what’s called an “unconference,” an anarchistic gathering where attendees sign up spontaneously to present talks or run workshops without a centralized organizing structure. 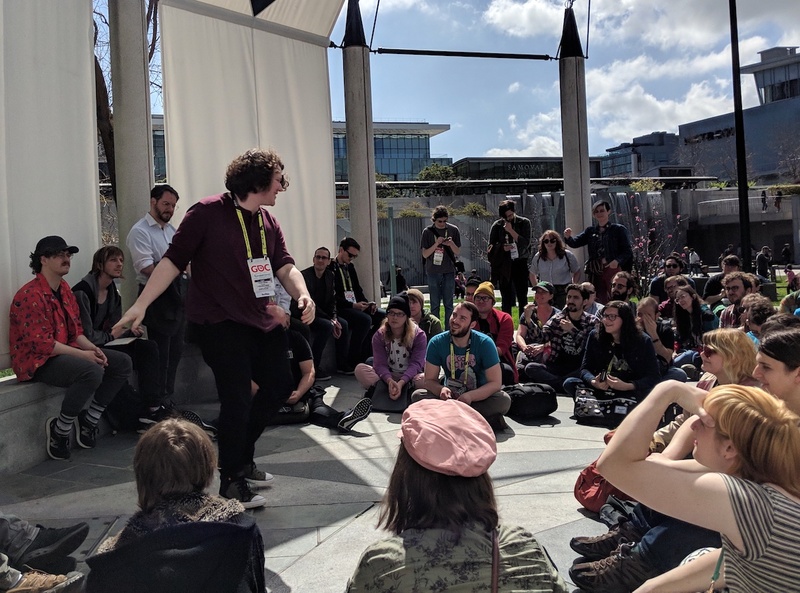 Founded in 2013 by a cadre of indie game developers as an alternative to the wildly expensive GDC, it has since become more of a folk tradition, carried on by new people every year. The “rules” of Lost Levels — if you can call them that — are simple. Attendees gather near a small plaza (referred to as a “gazebo” despite it not really looking much like one), often with their lunch in tow, and sit in a circle. Anybody can sign up, open mic-style, to give a 5-minute “microtalk” about any subject they want, often but not always related to game development. The ideas on display at Lost Levels are as radical as its structure. Microtalks can center around experimental game design concepts, post-mortems on projects, political statements (pretty much exclusively of the left-wing variety), or personal stories. The crowd skews pretty young, but attendees come from all sides of the industry, from students to indies to major studio employees, and include GDC pass-holders, folks who hover around GDC but can’t afford a pass, and even the occasional local office worker on their lunch break. 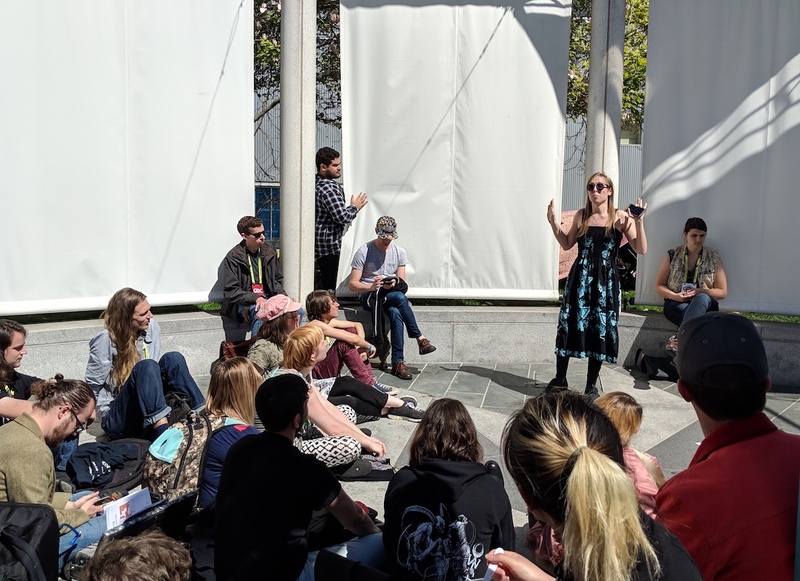 There’s a delicious irony to Lost Levels’ enduring popularity; while GDC charges hundreds to thousands of dollars to enter its halls, there are people who will skip all that for a few hours just to sit in a park and listen to stories from their peers. Its original organizers refer to the gathering as “radically casual,” which somewhat undersells just how radical the whole enterprise is. Lost Levels provides a space for game designers to decommodify their interactions, focusing for a glorious three hours on art and community-building over business cards and the building of personal brands. It was the highlight of my GDC this year, and since I managed to take notes on most of the microtalks, I decided to write up some summaries for the many people who couldn’t make it! The following summaries are far from complete, since there were a few talks I missed and some others I couldn’t hear very well (amplification isn’t allowed in the park). If you were one of the speakers and would like me to include your name/social media handle and pronouns (I defaulted to “they/them” for most people) or if you want me to remove the summary for privacy reasons, just send me an email at evanm AT anigamers DOT com or DM me on Twitter @VamptVo. Advice on how to come up with names of locations and characters in your games. The speaker suggested using words from different languages as inspiration and taking a look at color to set a mood, among other things. A white man in his 50s spoke about how inspired he is by the younger generations and the new ways that we talk about identity and oppression, and how it’s pushed him to become a coach who tries to teach other privileged people how to be better. The speaker talked about their experience with anxiety after a big move and how they made a game that they described as “low-stress WarioWare .” It includes mini-games like popping bubble wrap, watering plants, and aligning a picture, and has some rules around what mini-games not to include: no body horror, and no games that make you feel bad about your real life (like cleaning a virtual room only to be faced with your real, messy room). Fisher described an awful bladder infection he had as a kid, then implored the audience to “go to the bathroom!” rather than sitting at your computer to keep playing or keep making your game. I appreciated the little dig he threw in at games that are designed to be seamless experiences, never giving you a good moment to log off. How procedural generation inspired Cass, as well as some discussion of what makes for good procedural generation. They shouted out Spelunky , pointing out that it “systematized level design,” ensuring proper pacing and such, compared to other procedurally generated games where everything feels the same. They ended by asking devs to explore procedural generation of things other than level design: text, art assets, and more. Tech companies are promoting coding education, and not for good reasons. The more programmers they have in the market, the less they have to pay everybody. And the education they’re promoting is technical, but doesn’t cover ethics, cultural context, or “critical play” (the idea of games that exist primarily to convey a message rather than to entertain). As the speaker argued, this lack of ethical and cultural background makes workers easier to coerce into performing potentially unethical work without questioning their superiors. I couldn’t hear everything this person said, but at least part of their microtalk focused on them avoiding online callouts to try to build a healthier community. A description of a scene from a movie where a woman dances through the streets and how the speaker always wanted to replicate it in a game, followed by suggestions from the audience about how to achieve it (one of them was to give the player an opposite emotion first to create contrast). Then the speaker invited everybody to skip around the park with them for the last minute of their microtalk, which a few people did! I couldn’t hear much of this one but I caught some bits about looking to analog spaces and live play as inspiration for your game designs. The speaker lamented the loss of “third places,” spaces outside of home and work where people can connect and build communities. As it relates to games, they specifically mentioned the ability for participants in third places to customize and augment them, and pointed out that games like Minecraft and Fortnite are enabling that to some degree. One term that stuck out to me was “digital community gardens,” calling to mind a space that belongs to everyone that can be collaboratively customized. A side-note that may be relevant to our readers: anime cons effectively act as a third place for many anime fans, and feature an element of real-world customizability since they are often highly driven by organic fan culture. A call for designers to prioritize educating their players through tutorials and other means so as to not lock people out of playing their games. The speaker talked about their personal dislike of violent games and celebrated games that provide ways to opt out of violence, allow players to customize their experience to make violence less visceral, or simply avoid glamorizing or over-utilizing violence. Examples included Undertale , with its famous pacifist/genocide system; Samurai Gun , which has an option to replace all the blood with cherry blossoms; and Hyperlight Drifter , where the violence is contextualized within the main character’s story. A designer who worked on Revolution 1979 (a game about the Iranian Revolution) talked about games about revolutions and encouraged fellow designers to tell more of these stories. One fascinating example was Suffragetto, a 1908 board game about suffragettes fighting police officers (heck yeah). There’s a common attitude among designers that players need to have their hands held in order to figure out a game, but the speaker implored the audience to reject that stereotype, and cited The Legend of Zelda: Breath of the Wild as an example of a game that doesn’t explain much and yet is still very learnable. The speaker described the changing games industry scene since 2012, including a painful account of how they attended Lost Levels while homeless a few years ago. One point they specifically criticized was the development of “cults of personality” around some people in the community. An account of the speaker’s starry-eyed virtual reality project, attempting to use VR as an “empathy machine” to connect abled people with disabled people’s experiences. They wanted to make a game where you play as a person with one arm and experience phantom limb syndrome, but after talking to a person with one arm they realized they were treating the condition as a novelty rather than as a real experience of real people. So they scrapped the project. This one took aim at the idea that your hobbies need to be monetized, and the speaker described their gardening hobby. Eventually it took a darker turn toward discussions of climate change. A criticism of games that lock their “front doors,” creating initial barriers in terms of things like difficulty or accessibility. The speaker pointed out that it can be OK to lock the door as long as you “open a window” by providing the player with some other way of entering the game. The speaker, who is local to San Francisco, talked up hackerspaces and makerspaces like Noisebridge in the city, encouraging developers to make use of their equipment and communities and create new ones in their area if none exist. Mid-Lost Levels I decided to get up for a PSA about image descriptions (a.k.a. alternative text) on Twitter. I encouraged everybody to turn on the checkbox in their Twitter settings and to write descriptions for all their images in order to help blind and low-vision folks take part in the conversation. This was a pretty simple one, basically just making the case that Toe Jam & Earl has many of the properties of a Roguelike (typically defined as having permadeath and randomized levels). As the speaker pointed out, lots of people probably think of Spelunky as one of the earlier examples popularizing the genre — not counting the original Rogue of course) — but may not realize that they already played a Roguelike much earlier in their life. I didn’t catch all of this, but generally it focused on ways that progress is being made in terms of better representation for women and other identities, but it can still be easy to accidentally exclude nonbinary folks in games. A short one about how sometimes people create games or communities around games and then throw their hands up and absolve themselves of responsibility for those communities and their well-being, and how they need to instead listen to the needs of the community and try to help. A student who hadn’t made any games yet but was excited about starting presented their ideas about game narrative, which mainly revolved around the idea that games should focus on emergent narratives that stem from the game systems themselves, rather than linear, “authored” stories. They said that people trying to make “cinematic” games should probably just be making movies. This one was kind of funny for me because I remember having some very similar ideas when I was a student, though I’ve somewhat mellowed out in recent years (cinematic games are fine by me). This was one of the more raw and emotional microtalks. The speaker got up to tell the audience that they’re struggling with life in general and trying to find a job in games, and encouraged people to hang out afterwards and talk to them. Compared to the kind of cynical networking that often happens at GDC, this was clearly someone looking for some genuine human connection to help them through their life. In response to the many microtalks that mentioned the seeming inevitability of climate change, the speaker told the audience that there are still things we can do, and pointed them to organizations doing work to fight climate change. I second this one wholeheartedly! A user researcher provided some tips and tricks on how to collect feedback on your game or software. As someone who performs user research pretty regularly myself, a lot of it was quite familiar, including one big takeaway: pay attention to user problems instead of their suggested solutions. Then you can come up with the best solution to their problems. This one was perfectly appropriate considering that this year a big Pokémon Go -branded “Powerbank” was installed smack in the middle of the gazebo. The speaker mused about the weird digital colonization/gentrification implied by a big company making a game that designates certain locations as “culturally significant.” They encouraged designers to make games about “our own spaces,” taking back control of them from large corporations. We wrapped up on a pretty appropriate final microtalk acknowledging the privilege of those who were able to attend GDC and Lost Levels, whether because they live near San Francisco or could afford a plane ticket, and reminding people to share what they learned here with the rest of the community, including those who couldn’t make it. That’s a wrap. Again, if you were one of the speakers let me know!